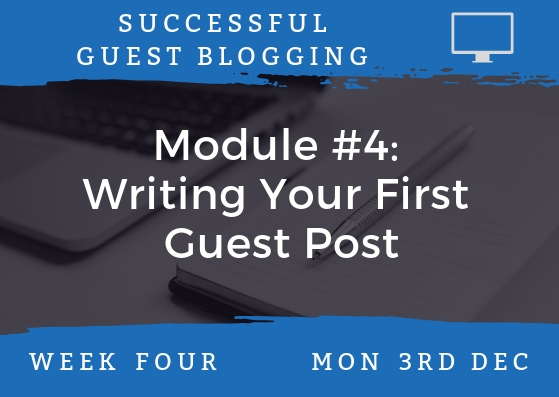 Successful Guest Blogging is an in-depth course that teaches you how to write guest posts for other blogs, in order to grow your audience, gain more writing experience, promote your products or services, or get paid as a freelancer. It costs $60 for the full six weeks plus four bonus weeks of free support after the end of the course. 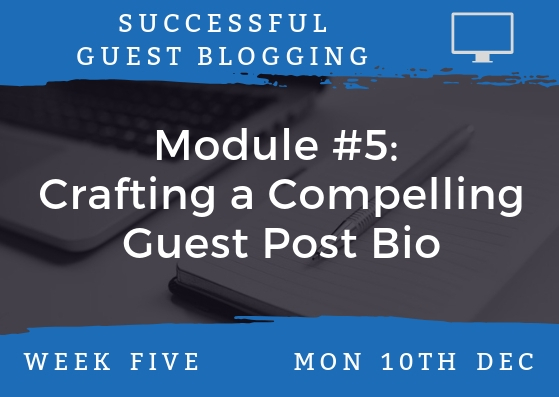 Successful Guest Blogging is a six-week online course aimed at bloggers and writers who want to start writing for large blogs. 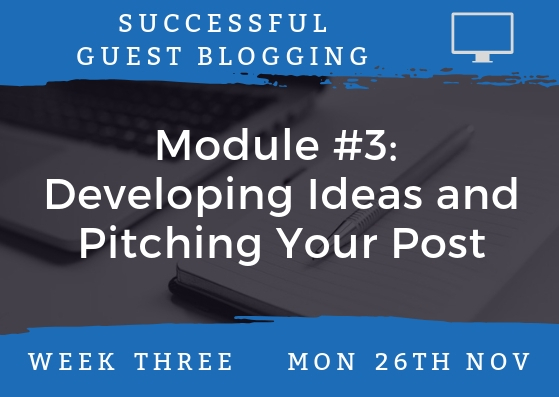 The modules cover, step by step, everything you need to do to land guest posts on major blogs in your topic areas: understanding your goals, getting your own blog ready, finding guest posting opportunities, pitching your ideas, writing and editing your post, and taking your next steps after you have a guest post published. 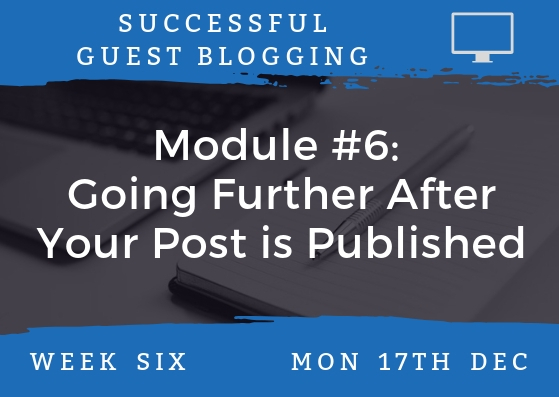 Successful Guest Blogging costs just $60 for the full six week course, which includes four free weeks of support after the course ends. 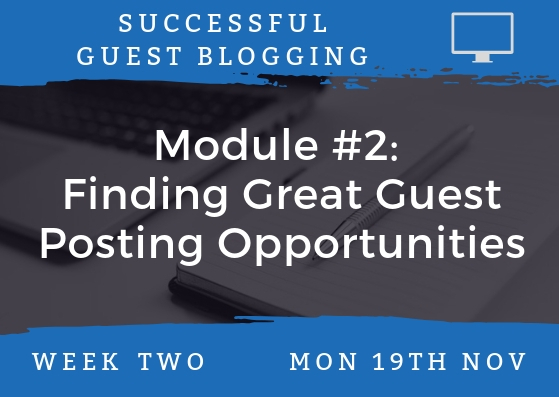 Understanding what guest blogging is, and exploring your goals: what are you hoping to achieve? As soon as you join, you’ll get an email with your Welcome Pack, which includes the full course schedule and the link to our private Facebook group. Every Friday, I send a quick reminder email, with the module link again. If you want, you can reply to any of the course emails to ask questions: replies come straight to me at ali@aliventures.com. All core materials are written, so you work through them as quickly or slowly as you like. You can download them onto multiple computers or devices, or even print them out to work through. Where appropriate, I’ll include screenshots or images to show you how to accomplish something (e.g. 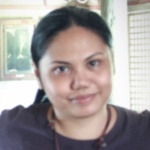 how to format your guest post as HTML). 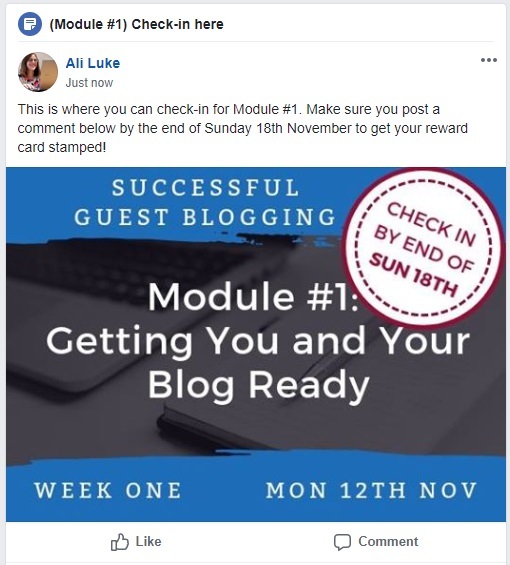 Successful Guest Blogging includes a private Facebook group where you can meet other members of the course — and where you can ask any questions you want. This is a private, members-only group, so no-one will see your posts except the people taking the course alongside you. After Successful Guest Blogging is over, I’ll be around on Facebook to support you for the next four weeks. After that, you’re still welcome to use the group to stay in touch with fellow bloggers. Of course, you can leave the group at any time and still have full access to the course itself. Although you get to keep all the course materials, so you can go at your own pace, you’ll get the best results if you stick with the group schedule and finish a module each week. Each week, we have a “check in” topic on Facebook: all members are encouraged to post here once they’ve completed that week’s module. The deadline is the end of the Sunday (e.g. if a module comes out on Monday 12th November, the deadline for checking in is 11:59pm on Sunday 18th November). If you check in before the module’s deadline, you get a stamp on your (virtual!) card. 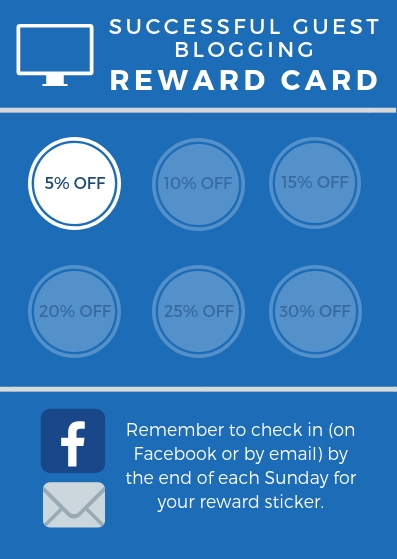 Each stamp equals 5% off a future course. You can get a total of six stamps – so up to 30% off. This can be redeemed on any of my other online courses. I’ve been blogging since the start of 2008 … and guest blogging has been a huge factor in the growth of my business. I’ve posted for dozens of different blogs across the years, including ProBlogger, Copyblogger, The Write Life, Write to Done, Craft Your Content, Helping Writers Become Authors, The Creative Penn, MichaelHyatt.com, and many more. 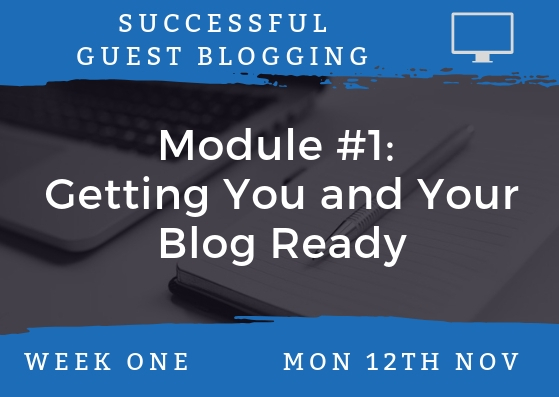 I’ve used guest blogging to grow my own audience, to sell specific products (particularly my Blogger’s Guides ebooks) and to make a name for myself in the blogging world. From early on, a high percentage of my guest posts have been paid ones. 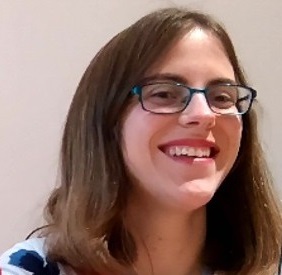 Whatever you want to get out of guest blogging, I’d be delighted to be part of your journey. Sign up now at just $60 for the full course (six modules across six weeks, plus a further four weeks of help and support). 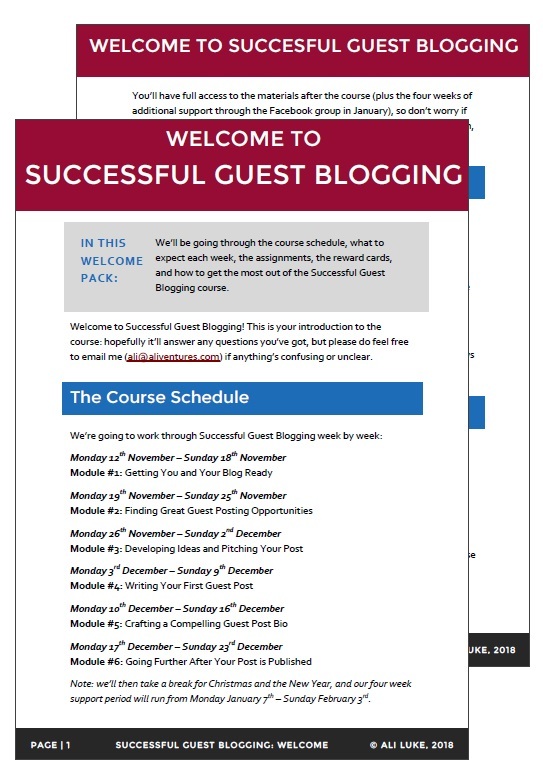 You’ll receive your Welcome pack straight away, so you can join the Successful Guest Blogging Facebook group and start getting to know fellow members who’ll be taking the course alongside you. I know it can be tricky to decide whether a course is going to be the right one for you. With all of my courses, I offer a full money-back guarantee. 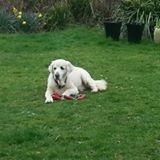 If you join and later decide the course isn’t for you, just let me know any time within the six weeks of the course, and I’ll be very happy to refund you in full. Just click the “Join Now” button above and you’ll be directed to PayPal to pay. You should see the option to pay with a credit/debit card, which you can use if you don’t have a PayPal account. (I never see your credit/debit card information or any other details; PayPal just sends me the money!) If neither of those options work for you, please drop me an email (ali@aliventures.com) so we can work something out. If you’d like to take a course but can’t easily manage the $60 fee up-front, do contact me, as I can offer you a payment plan (e.g. $20 each week for three weeks or $10 each week for six weeks). I’ll never charge you more than the $60 price of the course, even if you need to pay in multiple instalments. If you have a reward card from a previous course and would like to use it for a discount on this one, please contact me and I’ll send you a special payment link.